but I’ve got something to say, five minutes and two images – and one of the images even moves slightly. I’ve been seeing posters and ads for the new Into The Woods movie that’s coming out in two days. It looks like many of the costumes are classic fairytale Middle-Ages or Disney-style prince and princess stuff – but I have to say I’m super impressed with one item. Apologies for the poor .gif quality. I couldn’t find a better picture on the Internets. The one below looks a little Photoshoppy, too. But whatever. 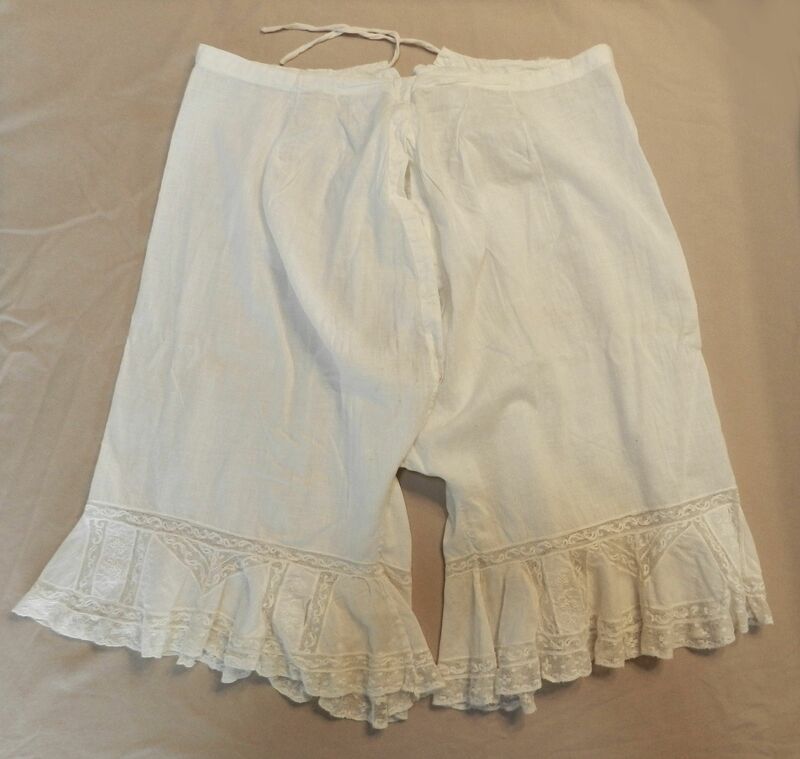 These look soooo close to a pair of original 18th century stays that I’ve seen – can’t remember which particular pair, if I do I’ll post it with a comment here. But really. The color’s nice, the shape is great, the seams and boning all appear accurate … even that decorative half-lacing down the front is correct. Of course we could debate about how they’re being worn … another issue entirely … but right now I’m impressed. I want to watch the movie just to see the rest of the costuming! I didn’t expect to be so busy with school this month, so writing a blog post had to be delayed. But I’ve been sewing for short amounts of time every so often, and I’ve gotten a lot more done! I eyeballed this from the earliest, simplest, documented chemisette I could find. It’s probably most accurate for 1800-1815. The collar doesn’t really fall the way the original did. I really wanted a dorset button for the closure under the collar, but I couldn’t find my button stash at the time. If I find it I’ll upgrade from this mismatched hook & eye. It’s wrinkly and saggy on my tiny hanger, but look at that wool. 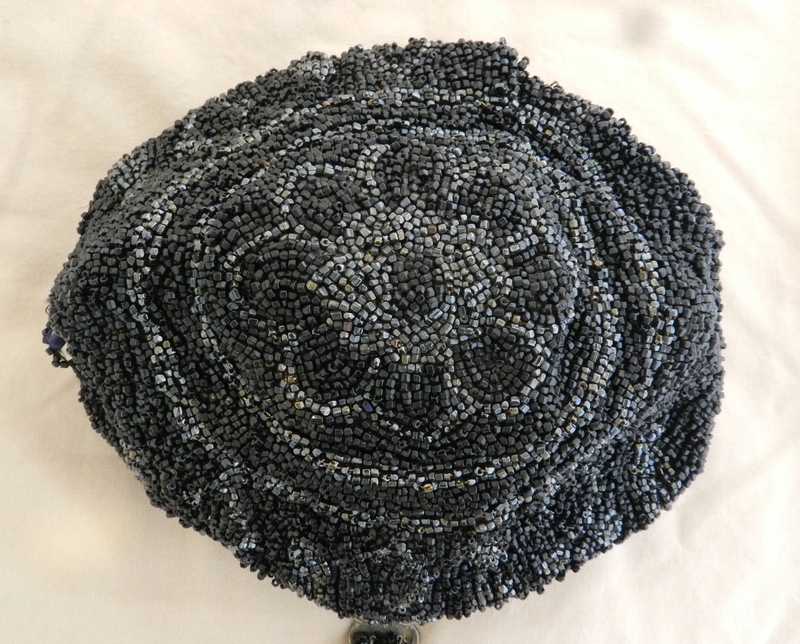 It’s black with a white diaper pattern woven in, and it’s gorgeous. 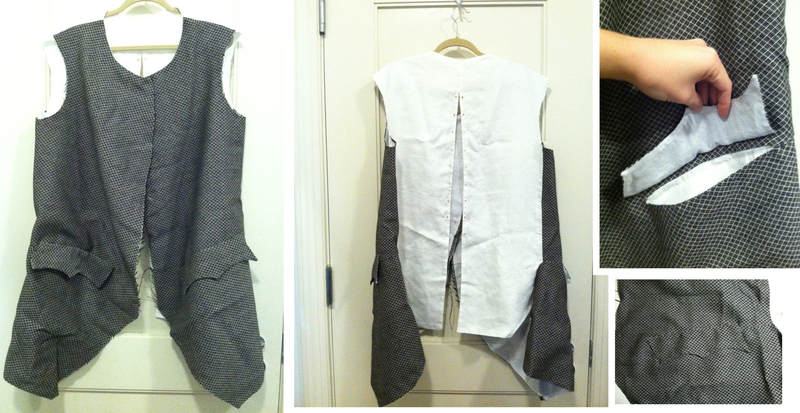 The rest of the waistcoat is made from some of the nicest linen I’ve ever found. I’m really excited for how it’s turning out! I dyed linen green, and I chucked a spool of linen thread in the dye too – but of course it didn’t take color so well, so I had to Sharpie the thread darker later. And I didn’t take enough photos of the process, but the body of the calash is basically a rectangle with a number of metal bones running through it, and the ends of that are gathered to a binding. The back is a teardrop shape, boned, and the calash body is gathered to that. Finished! It’s not perfect but it’s cool. It turned out a little too small; the ridges touch the top of my head. I also made it too long, so I had to add thread stops inside to keep it from extending fully. Right now it has icky polyester ribbons, but I want to get some nice silk ones for it soon. 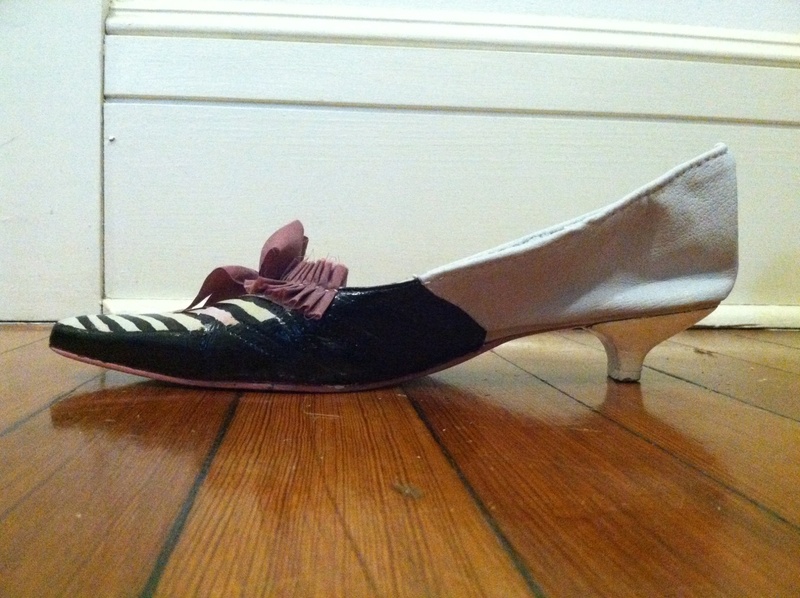 6) and because I don’t know when to stop, I decided that I need a nice comfy pair of half-boned 1780s stays. They’d be better for the events I do, which involve setting up displays and then sitting for hours on end – something my fully boned 1740s/60s stays aren’t so nice for. 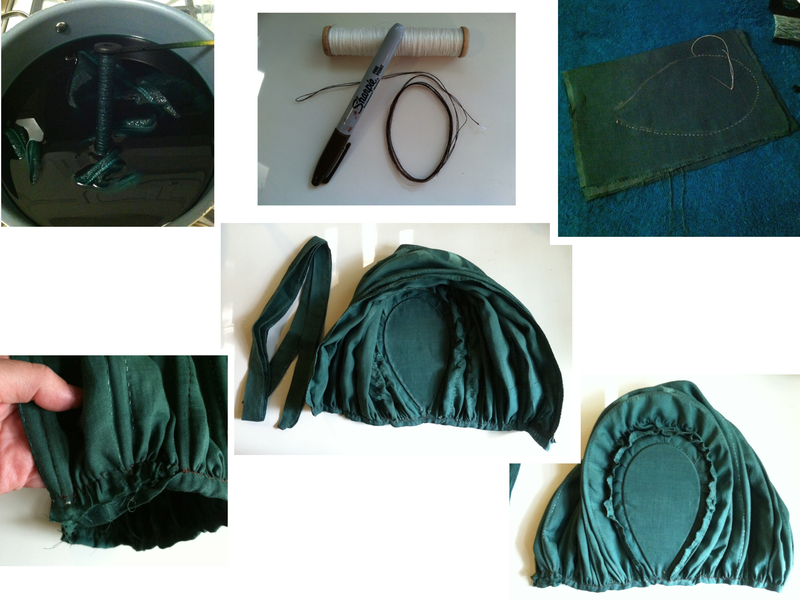 I haven’t taken scissors to cloth yet, though, I’m still thinking about how to do those. Later. And finally, a tiny life hack. 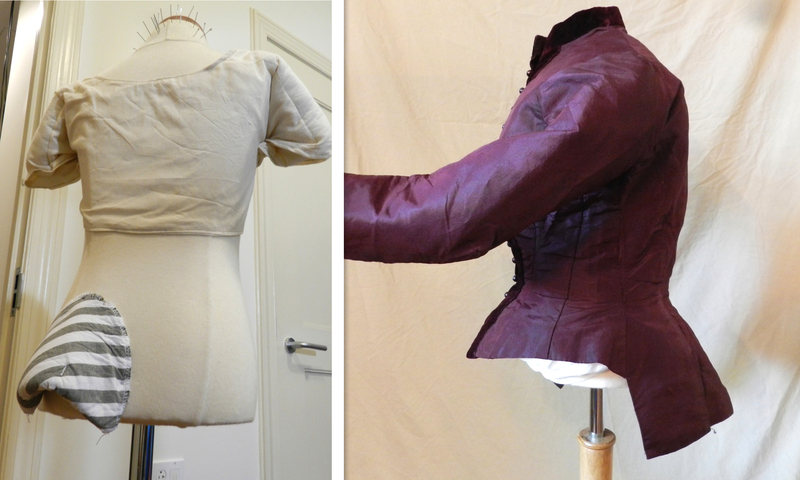 I needed to shape and pad out this mannequin a lot to photograph my 1880s bodice, and my epiphany was to use old shoulder pads. I pinned them to the mannequin making sure the pin heads were flush. They really helped puff out the tails. I’m thinking of making some ‘for real’, with nice cotton and fiberfill. It’s done! The un-bodiced, bodiced petticoat. Could use a good ironing. But as I look at it, I see a mistake. I should have concentrated the gathers further to the back. Right now I think they’re going to be under my arms, which will make the dress over them wrinkle and bulge. Sigh. So I’ll try it on tomorrow and see if I can make it work. If not, I’ll rip the sides of the waistband out and re-sew it. Yayyy. 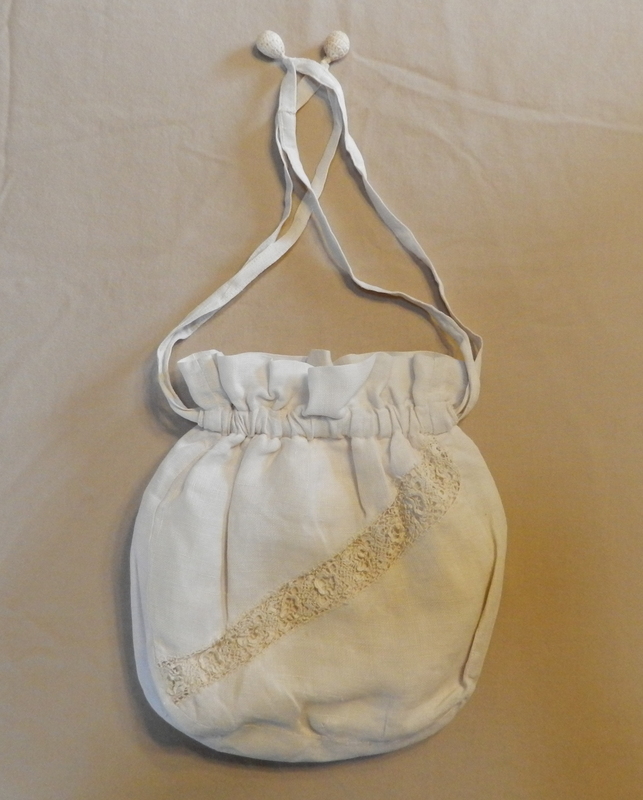 In the past few days, I’ve hand-sewn half a silk regency gown, half a bodiced regency petticoat, finished repairing a quilt for a friend (by hand), begun a c. 1760-70 linen and figured wool waistcoat for my dad, and made a hand-embroidered reticule. It’s kind of saggy-looking without anything in it. 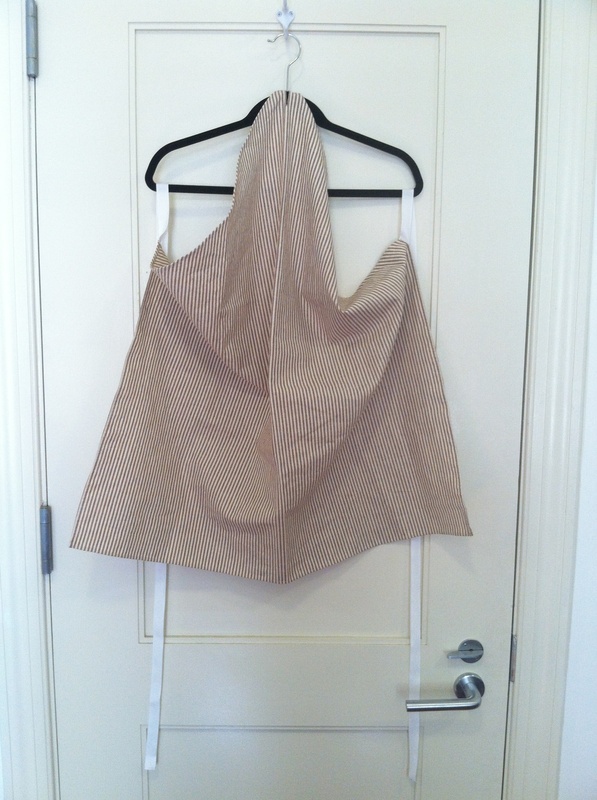 Linen with linen embroidery, cardboard base, and a silk bow. 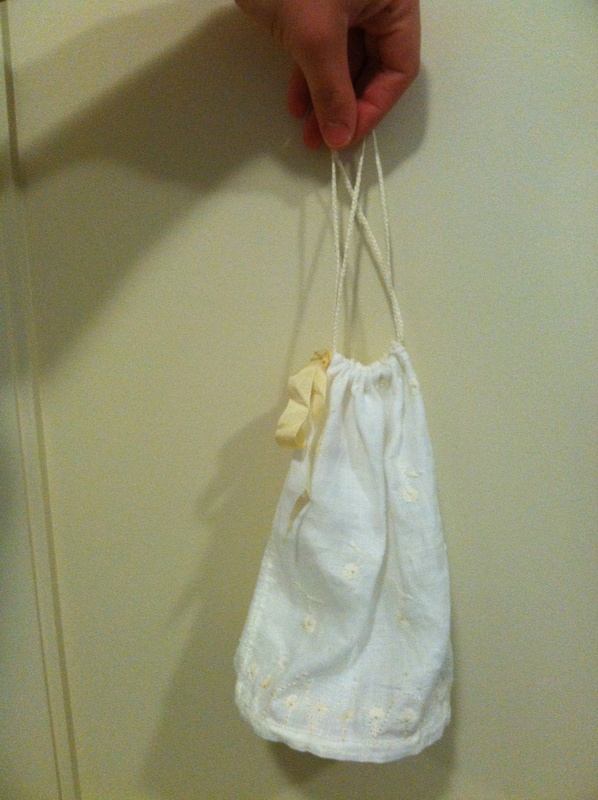 Eventually I’ll add some nice silk handles/drawstrings. I’ve shelved the cote idea until next year’s Renn Faires. I don’t have the time to sew a new cote this year. Meh. 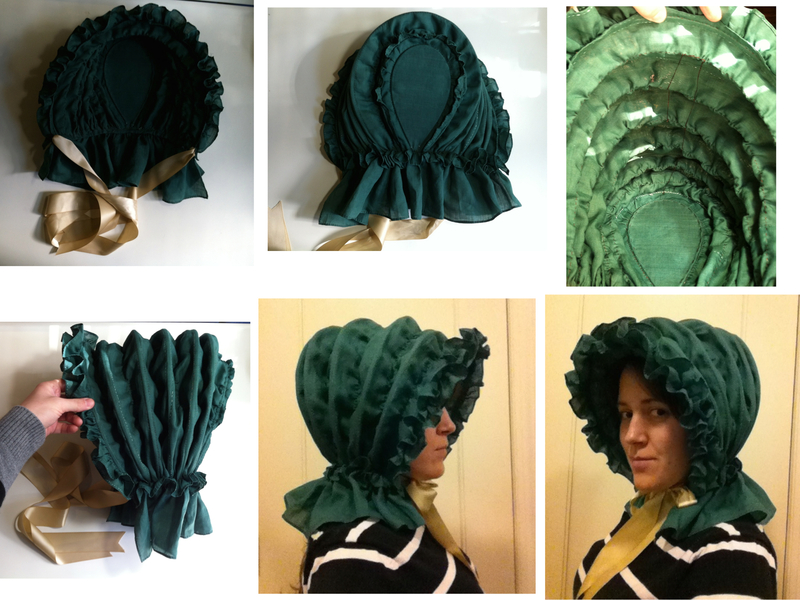 I’ve been putting more time into is my 1790-1810s clothing. I’m realizing that I’m really lumping a lot of variances into one outfit. I’d love to specify the outfit to a smaller, earlier year span, but that’s going to have to wait, too. 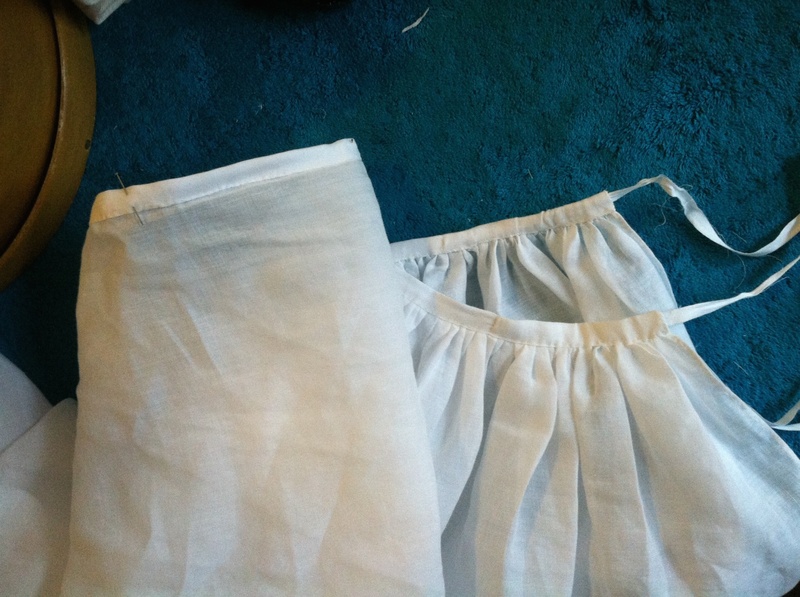 So today I’m (writing my paper for school) assembling a bodiced petticoat, which is confusing me. Not over the construction, that’s fairly straightforward, but over its actual existence. The bodiced petticoats I see seem to actually be bodiced skirts, meant to be seen, and worn with a short jacket over them. I’m having trouble finding attributed 1790s-1810s petticoats. Usually I would interpret that as meaning this garment wasn’t so popular. But women had to wear petticoats, right? From what I can tell from prints and paintings, women’s skirts are too full in general to be just a dress skirt worn over a chemise. Maybe the petticoats of that era were often remade into other garments, and just didn’t survive very well. Or maybe I’m missing something! 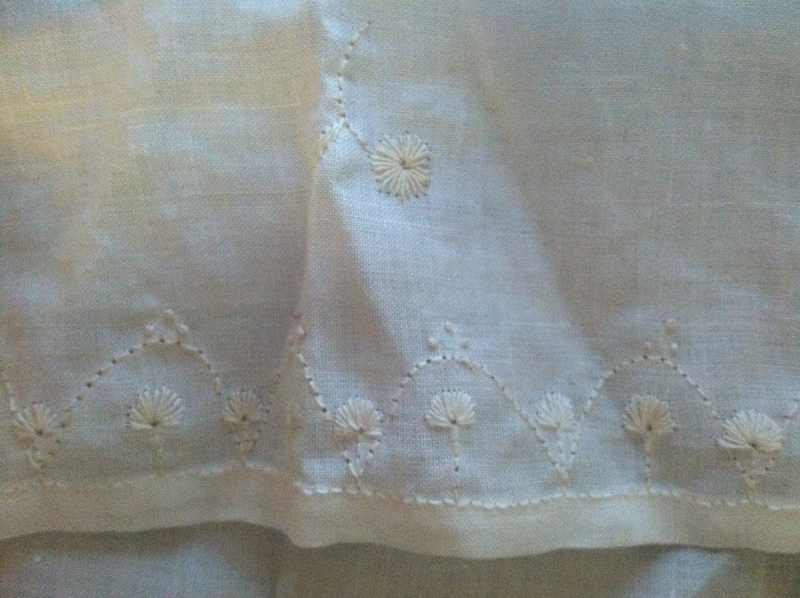 I found one from The Met: linen, from America, and dating from the early 19th century – and the only photo of it is super cropped. You can still tell that it’s got little straps over the shoulders, a surprisingly low waist, and a drawstring neckline that ties near the left armpit. 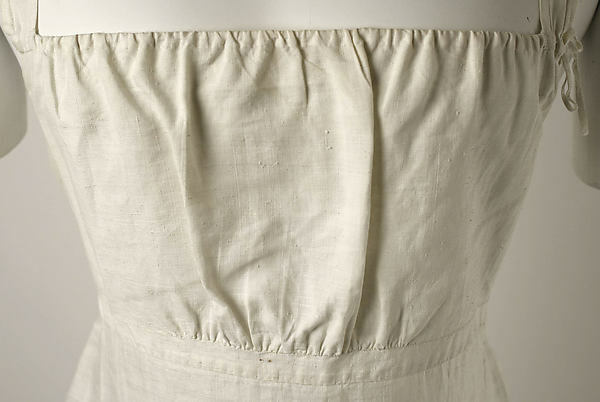 It’s almost a modern slip, rather than a petticoat. I’ve also seen a few unattributed photos of empire/regency bodiced petticoats floating around the interwebs – some have bodices, and some just have little suspenders. I think I’ll go with the suspender model; while I can’t find much to back up this style, it makes sense to me, and will eliminate some bulk, since I’ll be probably wearing it in warm weather and inside heated buildings. 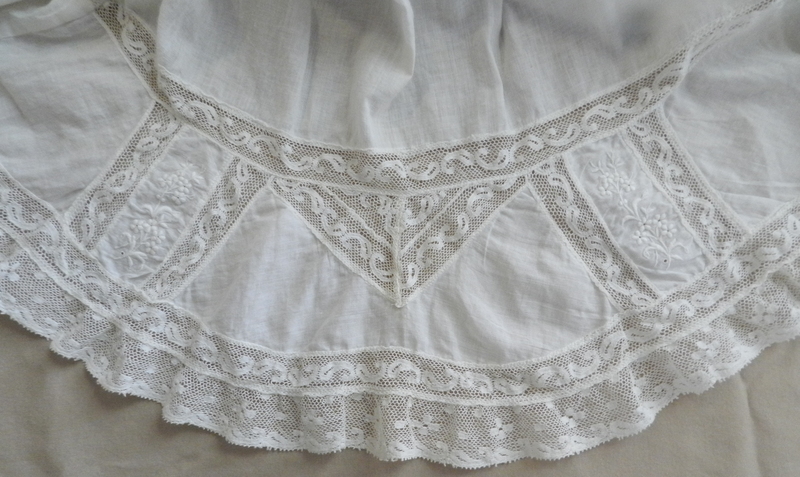 So my petticoat is made of a nice, fine 100% linen, and all hand sewn with linen thread. 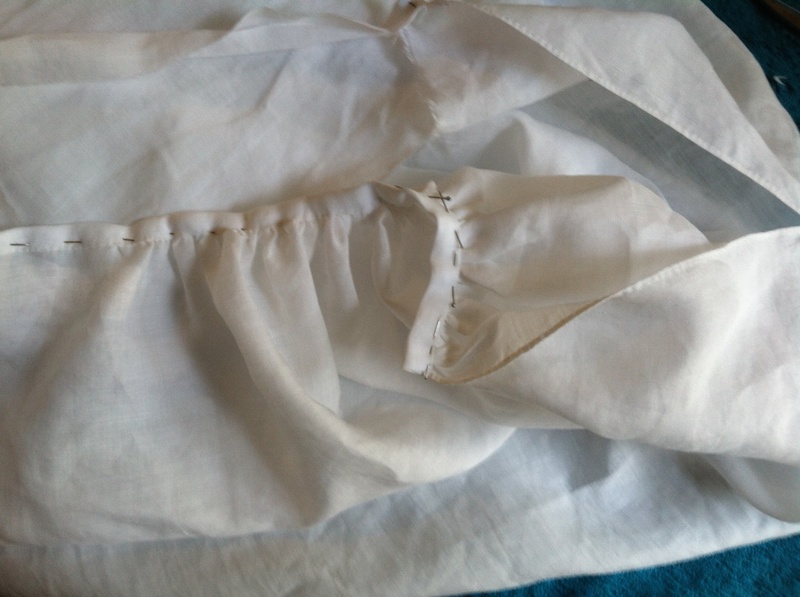 I left the selvage at the hemline and added a pleat. I’m hoping this adds a little more body to the skirt, especially at the back. The waistband, halfway pinned on. … and finished, with the gathers concentrated at the back. 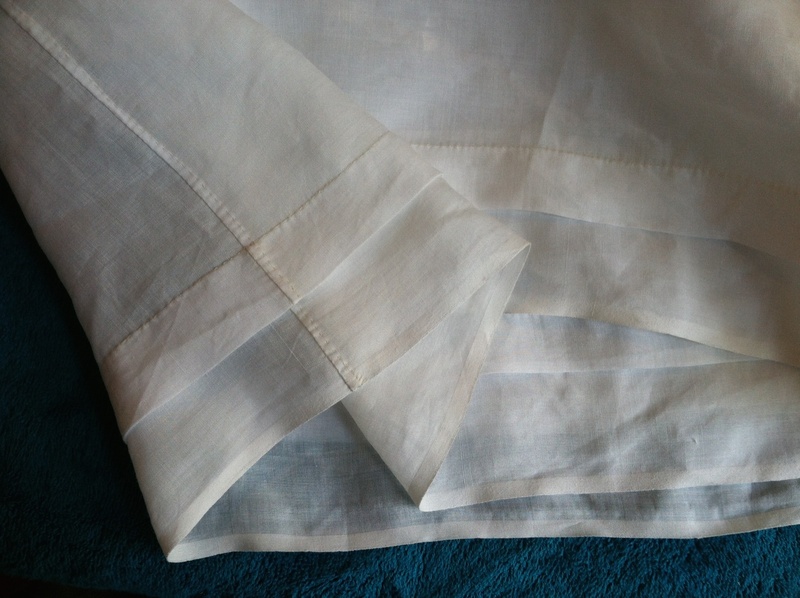 I was lazy and didn’t want to go buy tape for the ties, so I just cut the selvage off some linen. It’ll work for a few wearings. 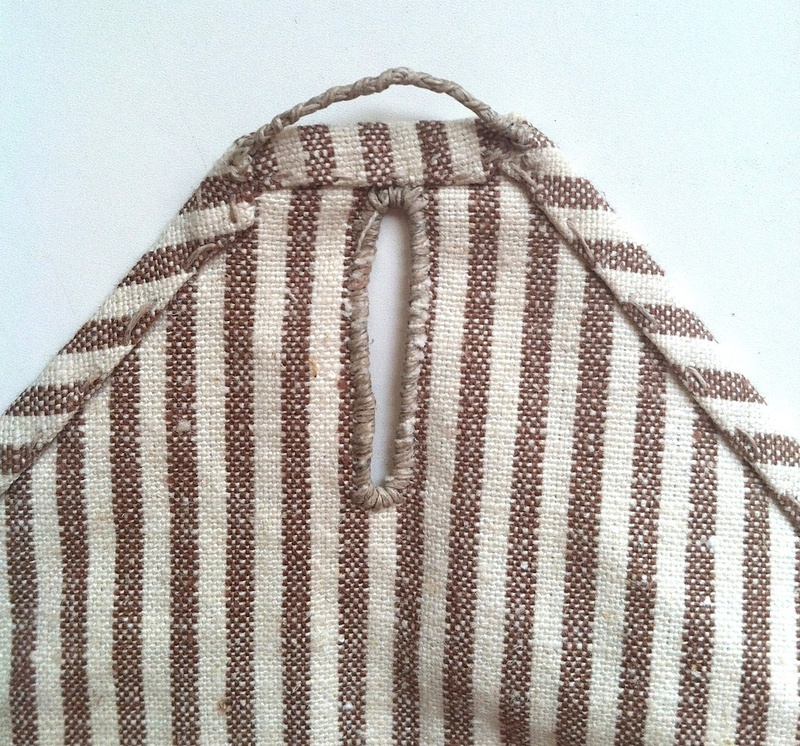 The ties are sewn into the waistband a few inches in, so they serve as a partial drawstring. Shoes! A dress! And a real live corset! Yay! But no stockings yet. 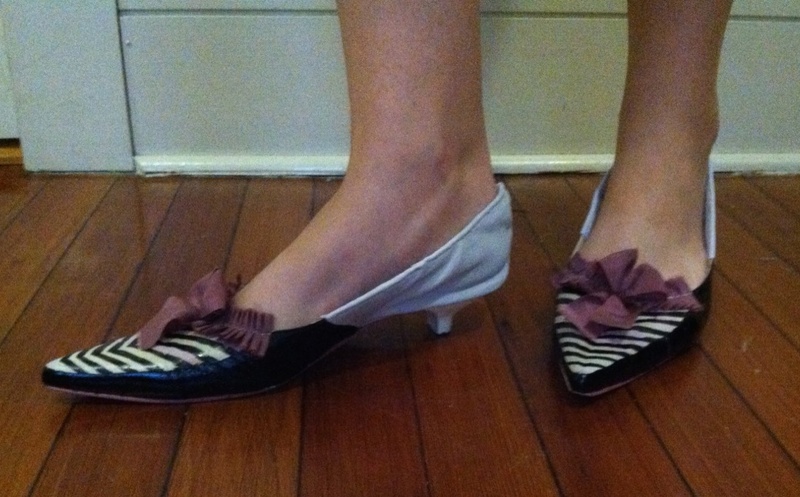 I came across these awesomely ridiculous pointy-toe 1980s shoes a few months ago, and have wanted to remake them into 1790s shoes since then. My inspiration were mainly the blue and black shoes second from the the top of American Duchess’s blog post, here, which suited the toe and heel shape as well as giving me a bold design to disguise all the faded marks on the toe. In progress. I had to move the mid-foot seam back to the heel a little, since I couldn’t get my needle through the layers at the ball of the foot. They were so much easier to remake than other shoes because I didn’t have to cover the toe, and because of the the sling-back design. 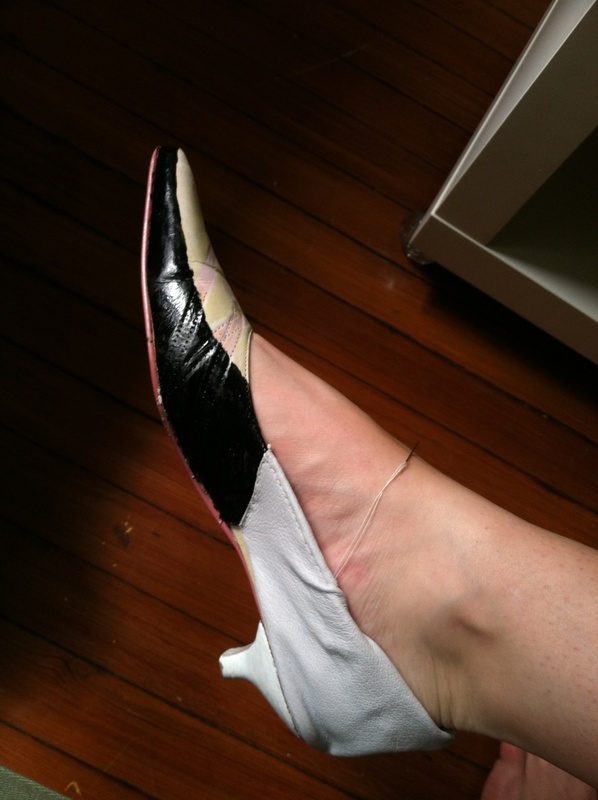 I sewed leather to the heel, then folded it up and sewed it to the slingback. Pretty simple. I painted the toe and heel with nail polish (which looks like patent leather when it’s dried) and tacked a silk ruffle and bow to the front of each, and voila! They’re not perfect, but I’m pretty pleased. The paint job is a bit crude. They’re certainly garish enough. They really need binding around the top edge and down the seam at the back of the heel, but right now my fingers hurt from trying to sew these things, so binding will come later. 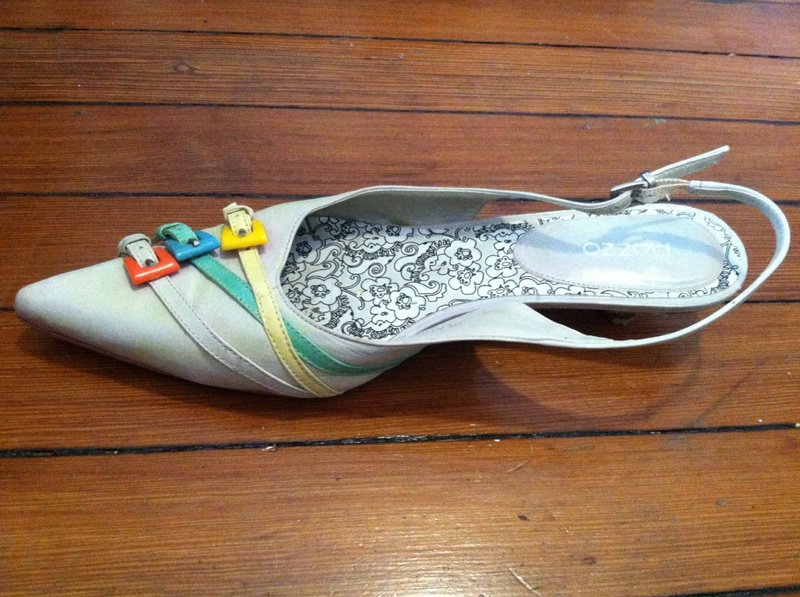 Another thing I’d like to do is paint the front of the heel brown, to look a little more like a sole. I started this corset almost two years ago! I didn’t have a pattern for it; I drafted it by wrapping the cotton around me and marking where I thought darts would be nice. Then I ran out of thread, wound up busy with work and school, lost interest and/or forgot about it. So, this weekend, I picked it up again and finished it in a few hours. Booyah. It’s not super accurate, but it’s 100% hand sewn and gives the correct shape though it doesn’t have a busk yet. It’s corded a little, and it’s got four pieces of boning – that’s it. It’s a bit too long to sit comfortably in. I think I can take the front up a little, but I’m just so pleased that it’s finally wearable that I don’t want to sew it anymore. 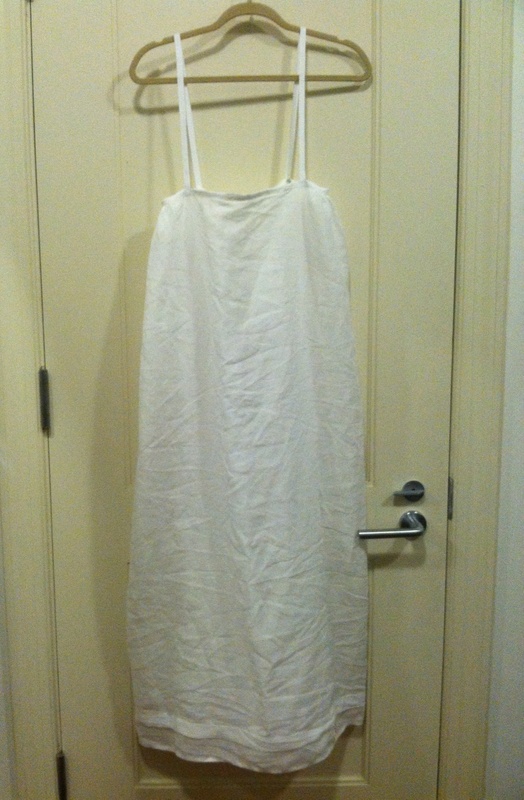 My goal was to make an unlined, very light dress. I’ve seen a few Regency and Empire gowns, and am always struck at how deconstructed they are compared to 1770s and 80s clothing. 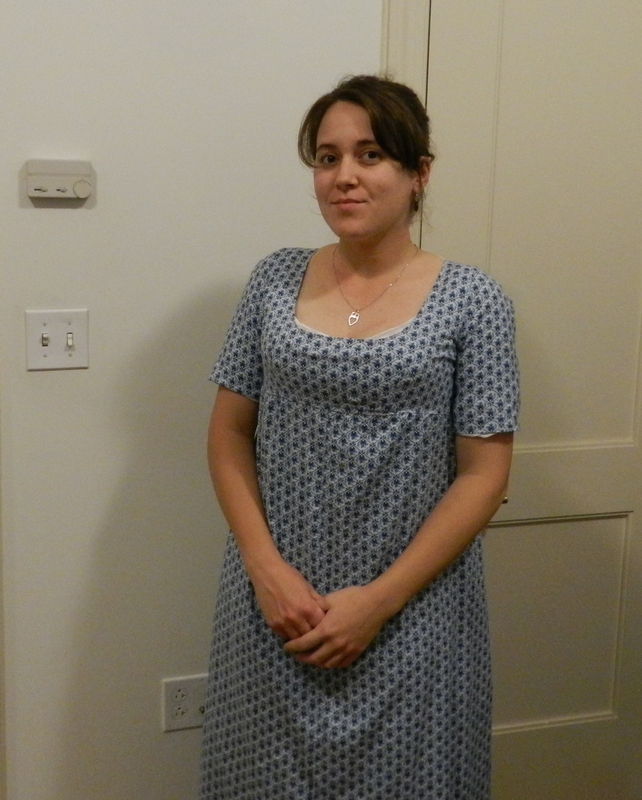 So I avoided my 1812 dress pattern with puffy lined sleeves, and started from scratch: no pattern, no lining, and 100% hand sewing. I draped it on myself, which went better than I expected. The air conditioning dial and me. 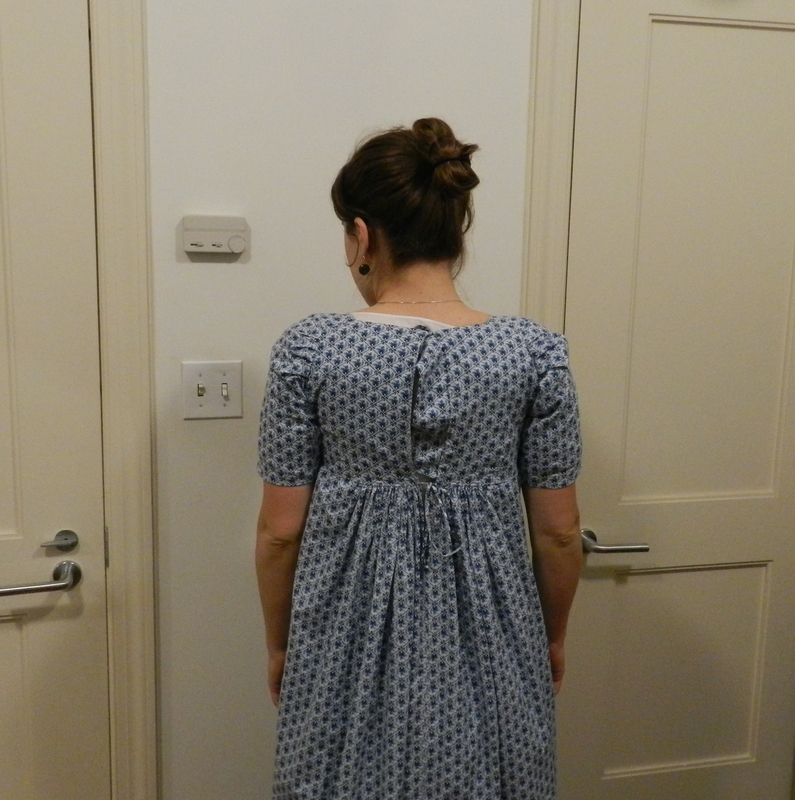 It needs a little more Grecian Bend for the late 1790s. I’m getting there. My design inspiration was mainly this dress, with the sleeves de-poofed a little because I wanted to go for a slightly earlier look. 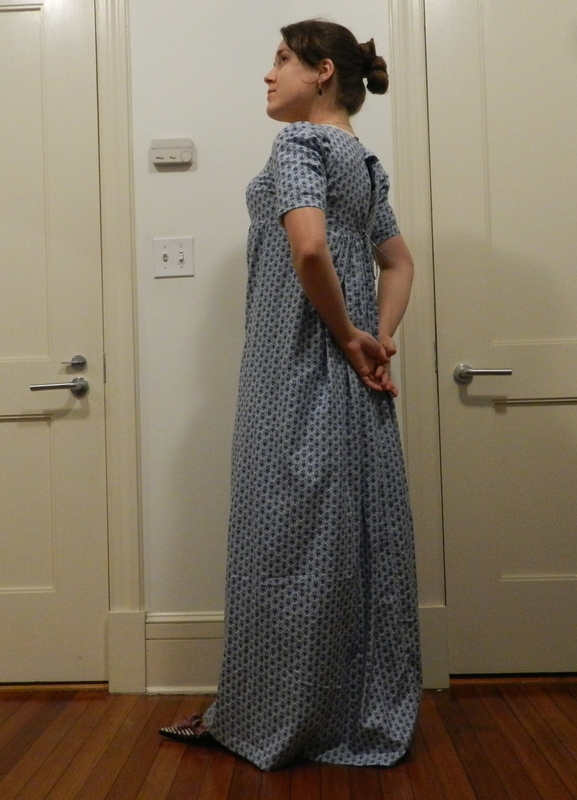 I’ve seen a lot of neoclassical gowns that close with two tiny ties or drawstrings in the back, but that doesn’t work well if you line the bodice and have bulky machine seams. 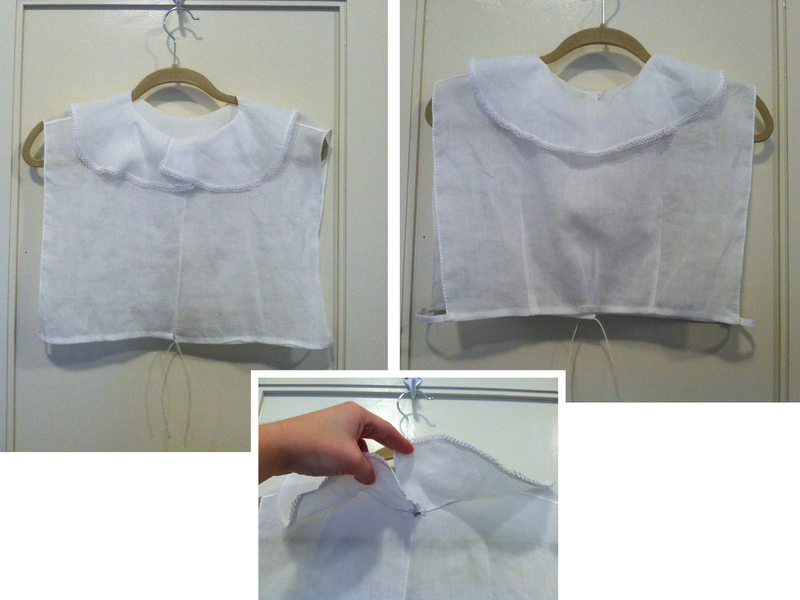 I had to line the back of my bodice to help hold the weight of the skirt. Then the back didn’t quite close. 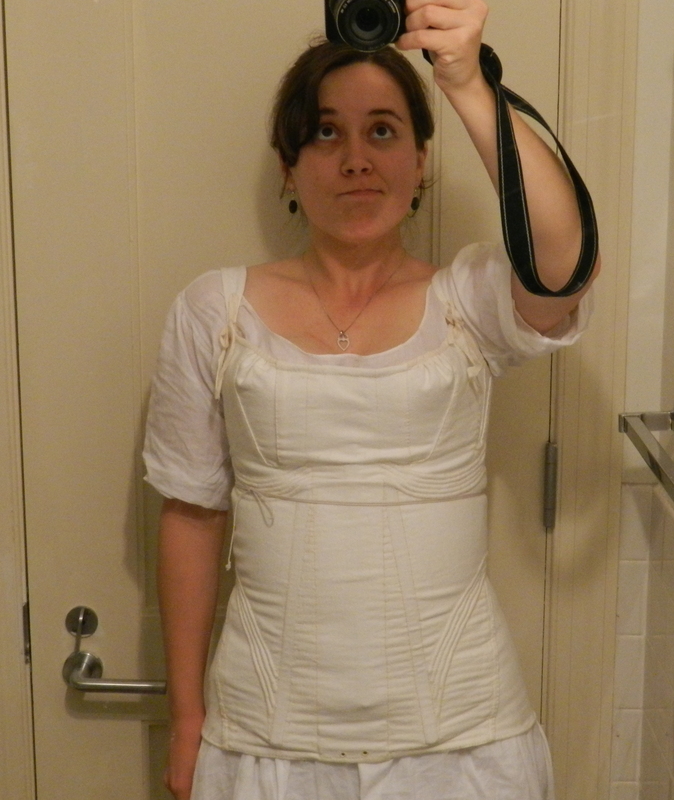 Nothing uglier than corset laces sticking out of the bodice. 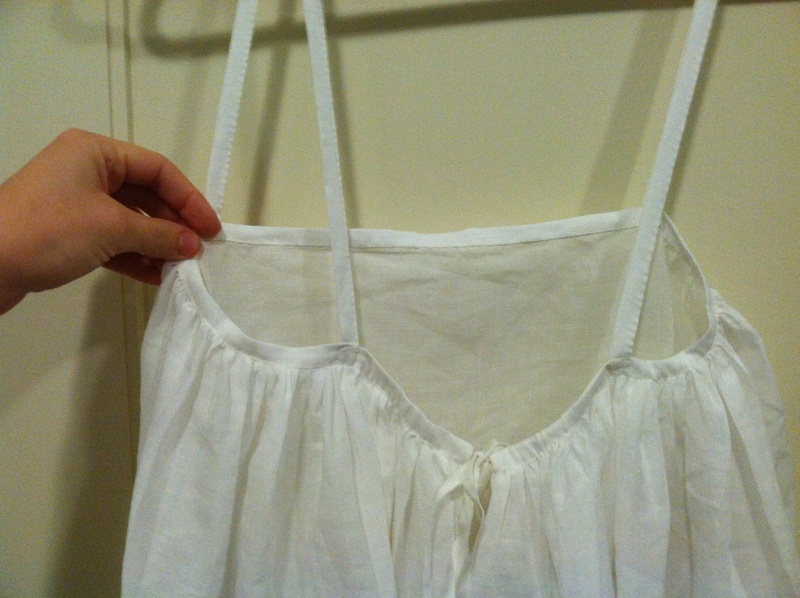 I came up with a kind-of solution that I’ve seen on one original: an inner flap to cover the crack where the bodice sides didn’t meet. Since this new solution doesn’t completely work (every time I move my arms it pops open again) I’ll add a third tie in the center and that should fix things. I hope. Still in progress, but so far I’m super happy with the effect of the hand-sewn linen embroidery on linen. 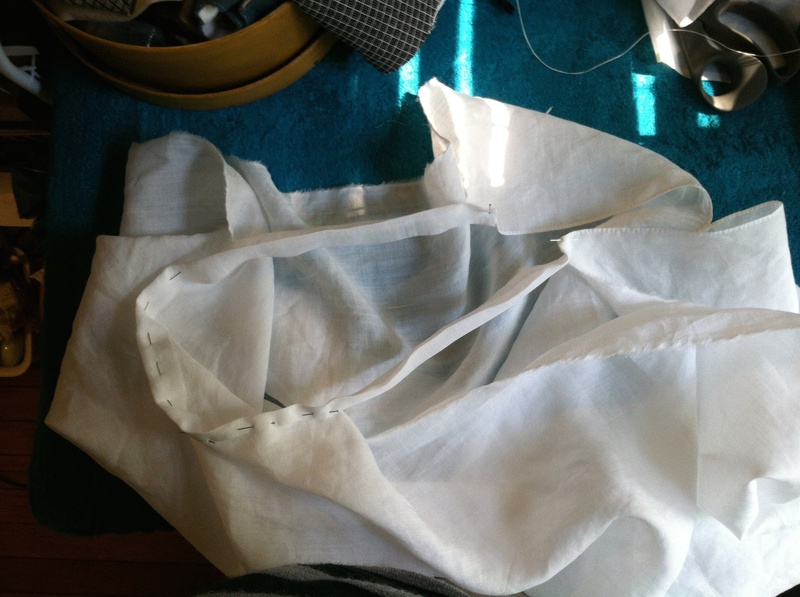 I’m going to make it a flat-bottomed bag shape, gathered with a drawstring at the top, and lined in cream silk. And now, since I can’t seem to find a living history group in the NYC metro area, the first time I may get to wear these will be in January or February. Boo. But, on a better note, I have two awesome costumey events coming up in the summer & fall, so I’ll be sewing for those soon. Yay!